Platforms: PlayStation 4, Xbox One; the game is also available on PC, PlayStation Vita, Android and iOS. Xbox One version tested. Review copy provided by the publisher. You’ll start this adventure amidst a pitched battle in the rolling hills of Catalonia during the Spanish Civil War, before leaping to the modern day, nestled in a cozy art gallery in the City of Love. Broken Sword 5 is a globe-trotting adventure, that’ll have you uncovering the seedy and often comical mystery. It is a very comfortable game, with equal elements of classic cinema as well as classic adventure games. You’ll meet a delightful cast of characters, all beautifully acted, as you work through each location to unravel the enigma. 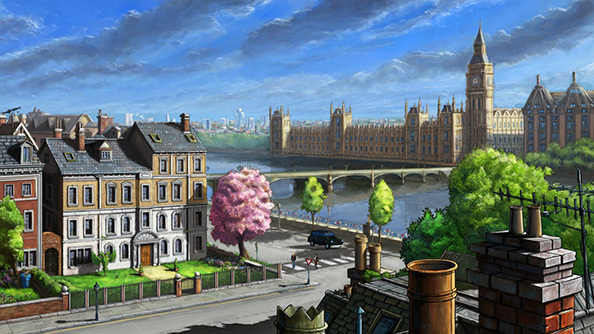 Broken Sword 5 is a delight to play, and absolutely gorgeous to look at. Broken Sword 5 is obviously styled as a comic book. It has bright, crisp and contrasting colors that create a beautiful, cartoon world. It’s absolutely fantastic to just stare at the visuals of a beautiful, postcard-esque Paris as you delve into its dark, equally gorgeous underbelly. I suspect that part of the inspiration for this comic book was the adventures of Tintin. Not only does it feature a similarly classic storyline that involves exploring exotic and interesting locations, but the central character’s have the same identical blond mop. This would also explain the overwhelming feeling that a comic book style isn’t quite right for the game. It’s truly stunning, that is clear, but the style of the game doesn’t quite match the subtitles and speech bubbles. From the very opening credits as we follow an eagle through war torn Catalonia, Broken Sword 5 looks like a classic film. The angles from which you’ll explore the world, the fading in and out from scene to scene. On top of that, there’s the classic noir story, of a stolen painting, conspiracy and betrayal. And for some inexplicable reason, it feels strange to portray this as a comic as your cast of characters explore the mystery of the ‘la Maledicció’. As with so many point and click adventures, the central characters love the sound of their own voices, and will narrate every single activity they undertake. Luckily the voice actors are all very talented and their observations are either useful hints or amusing asides. Like most games with a puzzle focus you’ll find yourself falling headlong into the routine of entering a room and clicking on all corners of it. Broken Sword 5 is certainly beyond the puzzle adventure titles of the 80s and 90s, but it certainly holds esteem for its heritage. 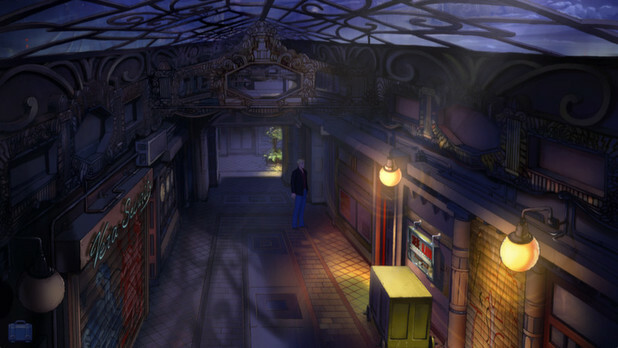 Unlike LA Noire that took the concept and tried to redevelop the mechanics, Broken Sword 5 sticks to its roots. You have to click on the floor to walk, and combine items in your inventory to create solutions to the ridiculous problems you’ll face. However much Broken Sword 5 may have moved on, there’s still some absurd logic you’ll have to navigate. Whether a store clerk won’t help until you’ve fixed his neon sign anagram, or a shredder you can’t run until you swab a Q-tip you’ve found with some oil on the floor, there are plenty of circumstances that will push you to the boundaries of sense. It is a shame that a lot of the puzzles that are littered throughout the game make little reference to the actual plot. It would be nicer if more of your creative problem solving was spent investigating the crime but each puzzle does have an interesting little story behind them. It’s not that the challenges you’ll encounter are completely devoid from the central narrative, it’s just that some can feel more like they’re tacked on for the sake of the puzzle rather than the game. In all honestly, this isn’t something that detracts from Broken Sword 5, and while you’re immersed in catching a cockroach, you won’t even notice how silly that is when you’re meant to be hunting a thief. Because the puzzles are engaging and well integrated into the different sections of the game. However outlandish the puzzle might be, in context it makes enough sense to satisfy. They will make you think too, although they’re not so hard you’ll be crawling to a walkthrough every thirty seconds. Most times you can find a clue in some dialogue with whomever set you on your current task, or just happens to be standing around at the time. Dialogue with the on lookers is enjoyable, as it’s broken up between the points of interest and objects you’ve uncovered on your journey. Each line will be stuffed with amusing jokes, and delivered by some stellar voice actors. There is a distinct issue with the pace of the conversations sometimes however, which can be more than a little distracting. Whether it’s some hidden loading screen or something else, lines between characters can have some fairly long pauses between them. It’s not a big issue at all, and Broken Sword 5 is no worse for it, but these pauses can build up to a slight irritation as they’ll break the flow or hinder the comedic timing of a sarcastic retort. These conversations can be a tad uninteractive too. While you’ll be directing the initial line of questioning, the conversation can follow on from that for a few minutes before you’re given control back. If you’re the impatient type, you can always just read the speech bubbles and skip the voiced dialogue. Again, it’s not a real issue, but occasionally you’ll solve the puzzle mid-sentence and have to tap through the dialogue before completing the task. 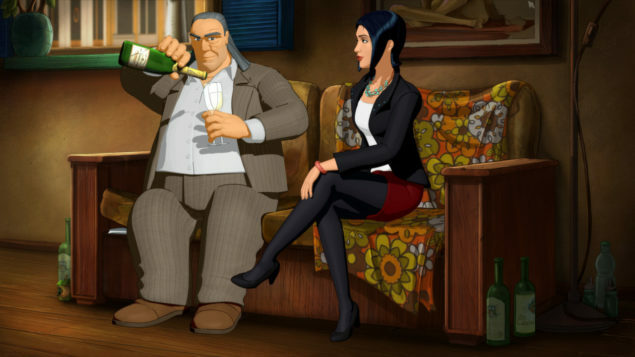 As a sum of its parts, Broken Sword 5 is nicely divided between dialogue and puzzle solving. Although not everything will make sense according to the rules of our world, there is a distinct internal logic that you can master and overcome. With an engaging, heartfelt and vintage story, some nice and enjoyable gameplay and dazzling graphics, Broken Sword 5 is bound to entertain. If you enjoy old school puzzle games, this is a must have. Broken Sword 5 carries all the hallmarks of a classic, and a beautiful Renaissance of the puzzle genre, it’s as intriguing as it is beguiling, and well worth your closer inspection.